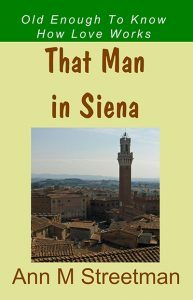 When Laura Langston, a nurse from Oklahoma City, went to Siena, Italy, to celebrate her 60th birthday, she was not looking for a man. But, there he was – 62-year-old Raffaele Balducci, a talented potter, jazz guitarist, father, and grandfather. His face was pleasantly wrinkled from many years under the Tuscan sun. He had lively brown eyes and dark wavy hair sprinkled with gray. Their attraction was swift and strong. Laura and Raffaele were old enough to know how love works and brave enough to search for their own way forward. I have vacationed in Siena more than once. Of all the places I have visited in Italy, Siena is one of my favorites. It is a fascinating city dating back to medieval times. It has an aura of mystery and romance, a perfect place for two people to meet and fall in love. My list of romance novels attests to the fact that I have a penchant for writing Italian men. Raffaele Balducci, a talented potter and widower still in love with his late wife, transferred swiftly from my imagination to the page. I had to work a bit harder to develop Laura Langston, a widow from Oklahoma City, who is thinking about downsizing and making changes in her nursing career to work her way toward retirement. Falling in love is not part of her plan. At 1 o’clock Raffaele knocked on her door. They climbed the stairs to his studio. He unlocked the door and stepped aside, motioning her to go in. “Please,” he said. Laura looked around the room. Laura nodded. “I would like that,” she said. He opened one of the cabinets, and she saw a stack of 33 rpm LP vinyl records. He pulled an album from far down in the stack. Without looking at Laura, he straddled the stool in front of the wheel and began preparing a piece of wet clay. He turned on the wheel and continued to work the clay. Then he threw it on the wheel and instantly placed both hands around the clay. Concentrating on the clay and his hands, he said, “The clay has to be smoothed and shaped. I have to feel it yielding to my touch as it becomes one with the image in my mind. Laura, come over here.” He stopped the wheel and wet the clay again. Laura walked over to him. He got up and said, “Sit here.” She sat down and he placed her hands on the centered clay. He leaned over her and switched on the wheel. Then he placed his hands over hers and began exerting pressure, turning this way and that way. “Can you feel the clay taking shape?” he asked.